My name is Liz, and I have been working for John Lewis York for about 2 and a half years now. John Lewis has always traditionally worked with local charities, and so I was happy to sign up when the branch pledged to support York Cares with the Community Challenge on 11th October 2016. Myself and eight other Partners went along to Hull Road Park to help regenerate a section of the Park. The rain didn’t put any of us off, and we were warmly greeted with a cup of tea when we arrived! We were supported throughout the morning with really good guidance from the team leading the Community Challenge. We worked together planting new cherry trees, and putting supporting stakes around to help them grow. 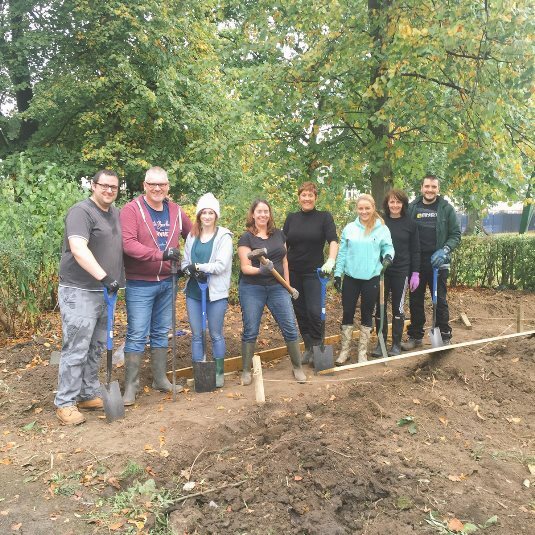 Other John Lewis Partners helped landscape an area of the Park where a new community cafe will be built. I’ve always enjoyed gardening and being outdoors so I knew I’d enjoy it, but I think we were all surprised just how much fun we had. It was really satisfying, and great to see how the Park will look when it is finished. As a work challenge, it was a fantastic team experience; we all worked together really well, worked hard, and amazingly didn’t talk about work once! As a team building experience for the workplace, as well as making a positive difference to our community, I cannot recommend it highly enough. Everyone was so friendly and welcoming, and I’ll definitely feel a little bit proud when I see our trees growing when I next visit! Thank you to York Cares for helping with such a rewarding experience!